James "Jimmy" Raymond Lowe Jr.
Plant a tree in memory of James "Jimmy"
Celebrating the life of James "Jimmy" Raymond Lowe Jr.
Be the first to share your favorite memory, photo or story of James "Jimmy". This memorial page is dedicated for family, friends and future generations to celebrate the life of their loved one. 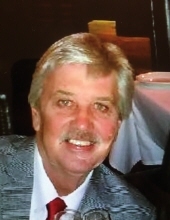 Obituary for James "Jimmy" Raymond Lowe Jr.
James “Jimmy” Raymond Lowe, Jr.
James “Jimmy” Raymond Lowe, Jr., a native of Mobile, AL and a resident of Saraland, AL passed away April 10, 2019 at the age of 61. He is survived by his loving wife of 31 years, Deborah Lowe; his mother Eva Purvis Lowe; his children, Miranda Ferguson (Jeremy) of Houston, TX, Mariel Lowe of Arlington, VA, Amanda Moore (Blake) of Fairhope, AL; his grandchildren, Chance Vice, Brodie Skinner, J.T. Ferguson, Beau Ferguson of Houston, TX ; 1 niece (Jennifer) of Baldwin County; one nephew (Justin) of Baldwin County; and many other family and friends. He is preceded in death by his father, James Raymond Lowe, Sr.; his sister, Pat Lowe of Tuscaloosa, AL. Visitation will be held 11 AM Friday, April 12, 2019 followed by Funeral Service at 12 PM at Redemption Church 1251 Industrial Pkwy. Saraland, AL 36571. In lieu of flowers, please send donations in honor of Jimmy Lowe to The Mitchell Cancer Institute of Mobile. To plant a tree in memory of James "Jimmy" Raymond Lowe Jr., please visit our Tribute Store. "Email Address" would like to share the life celebration of James "Jimmy" Raymond Lowe Jr.. Click on the "link" to go to share a favorite memory or leave a condolence message for the family.